Measuring the ability and the time taken for a powder to flow through an orifice of known size is a useful method of quantifying powder flow. The cylinder attachment comprises a stainless steel cylinder having a capacity of 200 mL and comes complete with a set of 20 interchangeable stainless steel disks (each having a precision drilled hole in the centre covering the following sizes: 4, 5, 6, 7, 8, 9, 10, 12, 14, 16, 18, 20, 22, 24, 26, 28, 30, 32, 34 and 36 mm) each of which can be secured to the bottom of the cylinder by means of a collar provided for this purpose. 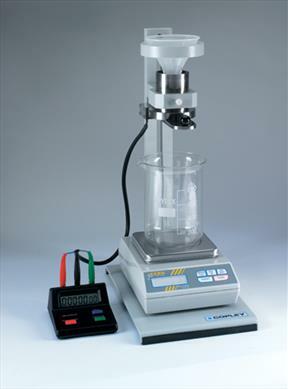 The cylinder attachment can be used in two ways (a) to carry out quantitative flowability tests based on mass vs time or (b) to determine the intrinsic flowability of the powder concerned in the form of a flowability index based on comparative measurements. In certain circumstances where, for example, the purpose of the test is to simulate flow in a hopper or other production situation, it may be preferable to use a funnel in the form of a truncated cone as opposed to a cylinder.